FREDERICK, MD-On Wednesday night, former Keys outfielder, D.J. Stewart , became the 164th player with Keys ties to reach the Major Leagues. Suiting up for the Orioles in their game against the Oakland Athletics, Stewart joins Ryan Meisinger , Steve Wilkerson , Austin Wynns and David Hess as other players with Frederick ties to reach the Major Leagues this year. Starting in leftfield on Wednesday, the former Florida State product went 0-for-3. Stewart had his contract selected from Triple-A Norfolk on September 11. In 116 games with the Tides, he slashed .235/.329/.387 to go with 12 home runs, two triples, 24 doubles, 55 RBIs, 59 runs scored and 11 stolen bases as well as 99 hits. Stewart led Norfolk in home runs, tied for first in doubles and also placed second in hits runs scored and stolen bases. A midseason International League All-Star, Stewart played all three outfield positions. 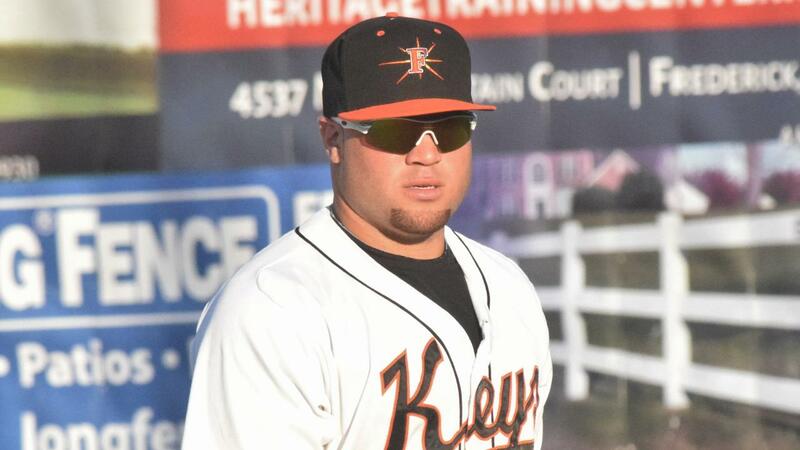 A member of the Keys in 2016, Stewart batted .279/.389/.448 with an .837 OPS in 59 games (he was promoted to Frederick at the all-star break. Ending with six home runs, two triples, 12 doubles and 30 RBIs, the outfielder saw his batting average and slugging percentage climb each month with the Keys. Originally a first-round pick (25th overall) by Baltimore in 2015, Stewart was twice an All-American at Florida State and was the ACC Player of the Year as a sophomore.